Database migration projects can often be complex. Even more so, heterogeneous migrations require planning among multiple stakeholders, multiple performance tuning exercises and end-to-end testing for full stack migrations to be successful. AWS’s new Workload Qualification Framework (WQF), part of the AWS Database Migration service, uses AWS Schema Conversion Tool (AWS SCT) to collect information to model existing Oracle and Microsoft SQL Server database workloads and provides instructions to convert them to Amazon Aurora. It identifies the complexity of the migration by analyzing database schemas and code objects, application code, dependencies, and performance characteristics, among other inputs. WQF can conduct a fleet-wide analysis of your entire database portfolio and help categorize migrations based on complexity and workload, so you're fully informed about the potential effort to migrate them into AWS. 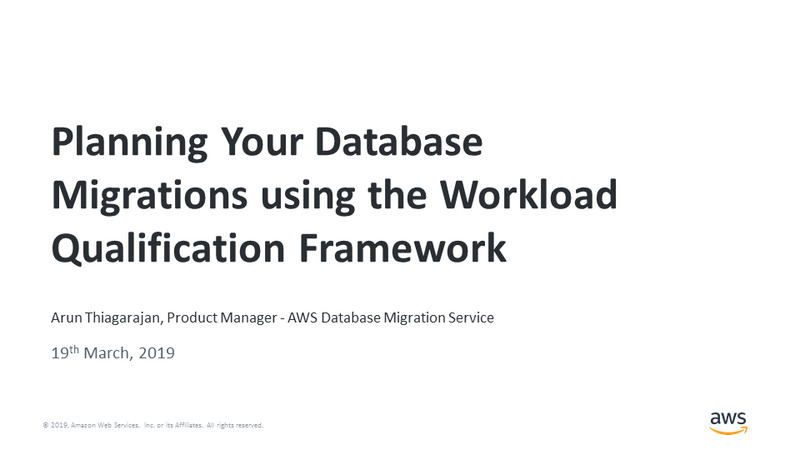 In this tech talk, we will introduce you to different migration workload categories and give an overview of how WQF can help you with your application and database migrations. We will also demo the tool and show you how easy it is to migrate your Oracle/SQL Server database over to the cloud.